A peanut farmer ex-president and a group endorsed by Brad Pitt and Muhammad Ali helped inspire UCI’s Olive Tree Initiative, which uses educational trips to explore Middle East strife, U.S. race relations and other volatile issues. Today, 10 years after the program’s first overseas excursion, OTI officials hope the concept will continue expanding to other universities and conflicts. To boost momentum, OTI has extended its reach to high school students, established alumni networking meetings across the nation and even added a Scottish university to its roster of college affiliates. A venture dealing with immigration and refugees is also on the drawing board, Wehrenfennig says. The group has come a long way from 2007, when a handful of Anteater faculty and students began toying with the idea of a one-time Middle East sojourn during which rival campus factions – pro-Israel and pro-Palestinian – would encounter both sides of the feud firsthand. 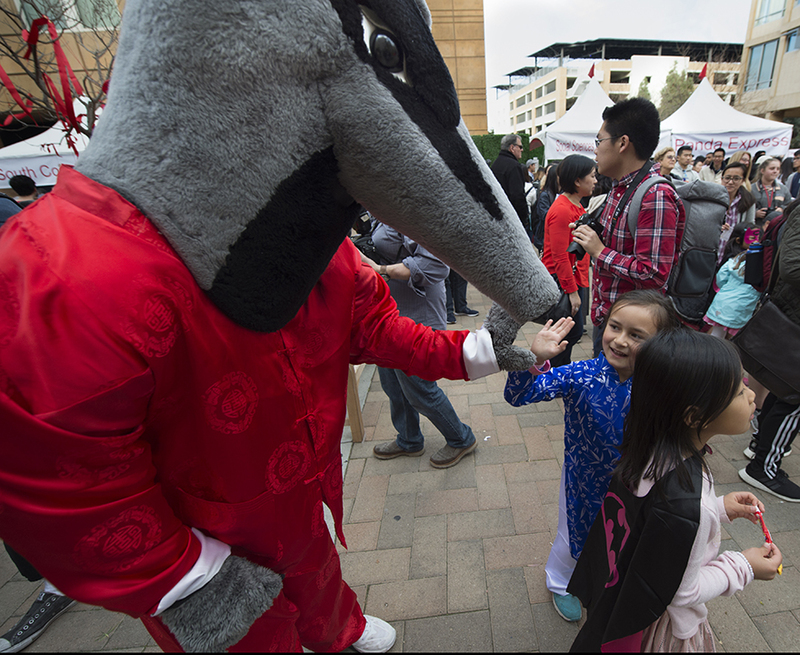 Two events at UCI sparked the plan. The first was a talk by OneVoice, a celebrity-endorsed organization that supports the creation of an independent Palestinian nation to resolve the conflict. The speakers urged audience members to visit the region. A few weeks later, in May 2007, former President Jimmy Carter spoke on the same topic at the Bren Events Center. He likewise encouraged Muslim and Jewish student leaders to “form a combined group … to go to Palestine and see what’s going on.” Carter even offered to help raise funds. UCI’s Center for Citizen Peacebuilding quickly embraced the proposal as a potential remedy for the growing venom between the camps. Invitations went out, and nearly 20 students gathered to discuss the idea. “At first, the only thing they all agreed upon was that the trip would prove the other side wrong,” says Paula Garb, an anthropology lecturer (now retired) who co-founded the peace-building center. “But I knew it would work when they started talking about how they would keep each other safe” in unfriendly terrain. After more than a year of fundraising and planning, 14 students spent two weeks traversing the Middle East, accompanied by Garb, Wehrenfennig (a Ph.D. student at the time) and Manuel Gomez, then vice chancellor for student affairs. Then something unexpected happened. As the students shared their experiences at forums on and off campus, the idea caught fire. What was supposed to have been “a one-off tour” blossomed into a small movement, Wehrenfennig says. 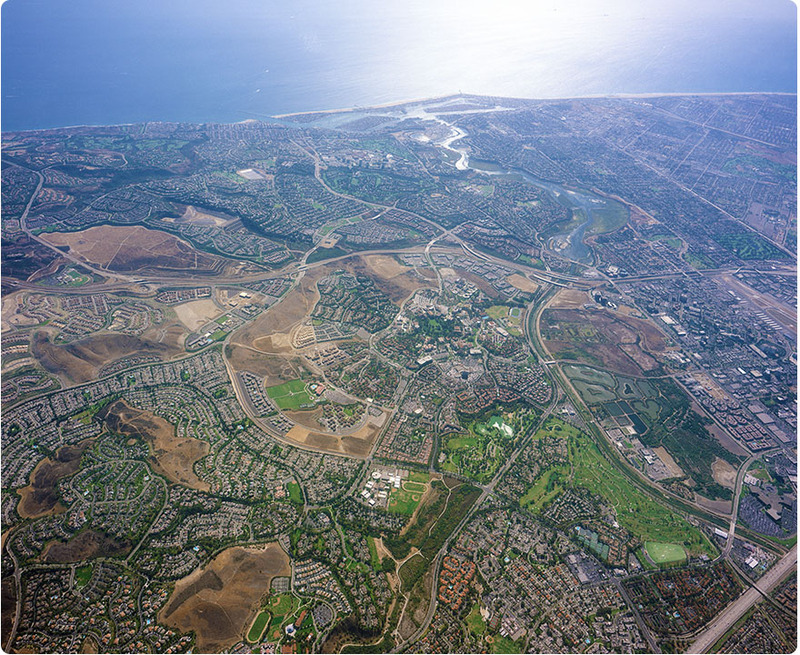 UCI donated office space to the fledgling group, and Cohen – joined by fellow traveler Ali Malik ’09 of the Muslim Student Union – pitched the concept to other campuses. Currently, OTI operates on 10 campuses – some more sporadically than others – and has expanded its portfolio of conflict excursions to include Turkey-Armenia, Ireland and the U.S. (race relations). An India-Pakistan journey was also contemplated, but the logistics didn’t work out, Wehrenfennig says. In each case, the aim is “to bear witness to as many different – and challenging – narratives as possible,” says OTI associate director Susan Seely. The race relations spinoff, inaugurated three years ago as the Deconstructing Diversity Initiative, runs a bit differently from its international counterparts. Instead of one long trek, students take a series of short jaunts to such places as Manzanar, California (site of a World War II Japanese internment camp); San Francisco/Oakland (to explore gentrification in Chinatown and the history of the Black Panthers across the bay); New Orleans (to examine the federal response to Hurricane Katrina); and San Diego (to learn about borders and immigration). Rather than engage with white supremacists, travelers hear more nuanced views from government officials, professors, police and local activists. That model influenced OTI’s new Diversity, Inclusion & Racial Healing Ambassador Program. Working with a handful of area high schools, the two-year pilot effort features afternoon seminars, day trips and mentoring from UCI students. The goal is to motivate teen leaders to promote tolerance at their schools, Wehrenfennig says. Although OTI can’t claim it has cured any of the hostilities it addresses, there have been other positive outcomes. More than 60 percent of the group’s 500 alumni have pursued graduate degrees, often supported by prestigious scholarships, OTI officials say. And many participants credit the program with instilling useful career skills. “The planning, fundraising, organizing, and traveling with classmates and counterparts taught me more than any traditional classroom,” says Katharine Azar ’08, a philanthropy and social causes consultant whose clients have included Maria Shriver, Dr. Phil, Norman Lear, Verizon, and the duke and duchess of Cambridge. Other “Olives” have gone on to jobs with think tanks, nonprofits, government agencies and news media outlets. As OTI alums become more established in their fields, Wehrenfennig hopes they’ll give back to the program – both as mentors to new graduates and as donors who can offset a drop in contributions from foundations, which currently fund about 25 percent of OTI’s budget. Garb would like to widen OTI’s impact by harnessing videoconferencing to bring speakers from conflict zones to students, in addition to the travel program. “We can’t send everybody on $5,000 trips overseas,” she notes. 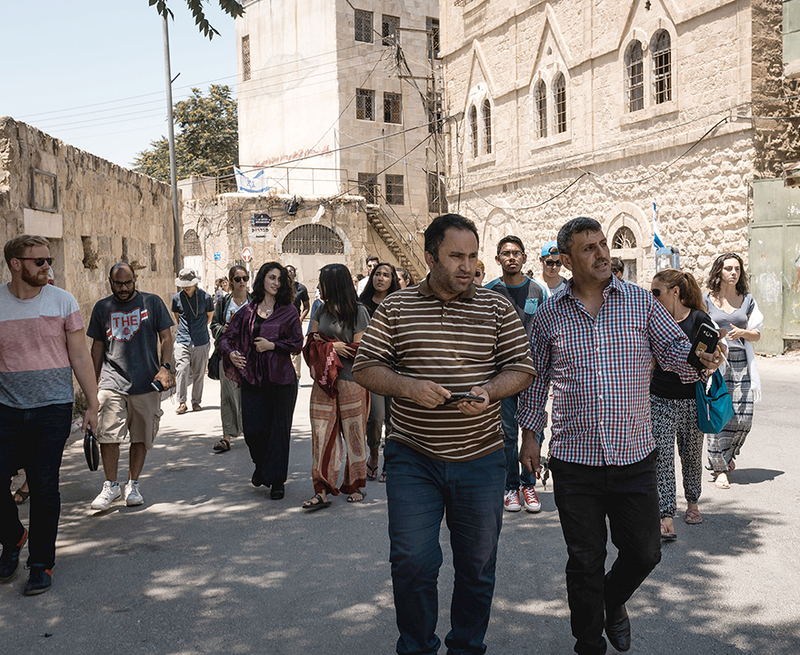 -pictured from top to bottom (courtesy of Olive Tree Initiative): The 2017 OTI cohort tours the Palestinian city of Hebron, in the southern West Bank, with residents. 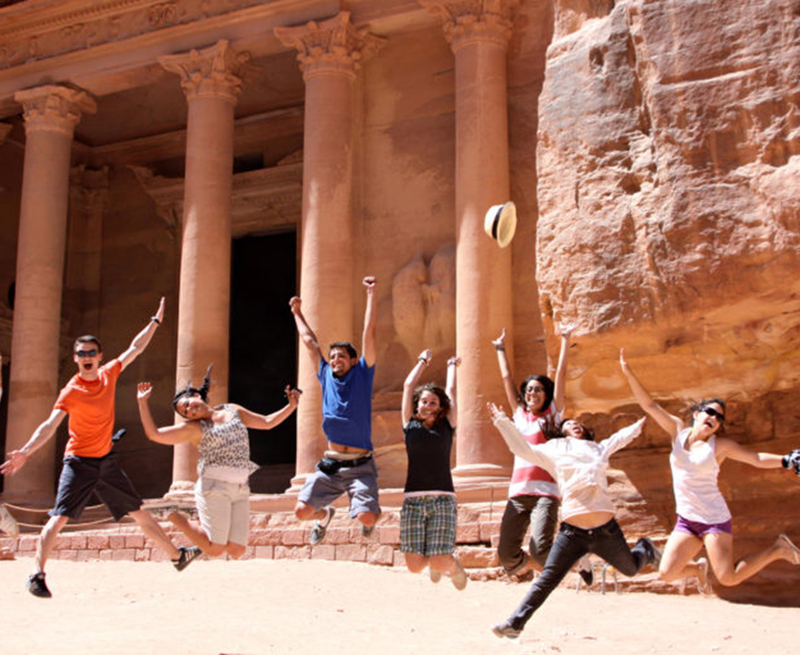 Students on the Olive Tree Initiative's 2010 trip kick up their heels in front of the iconic Treasury edifice in the ancient stone city of Petra, Jordan. 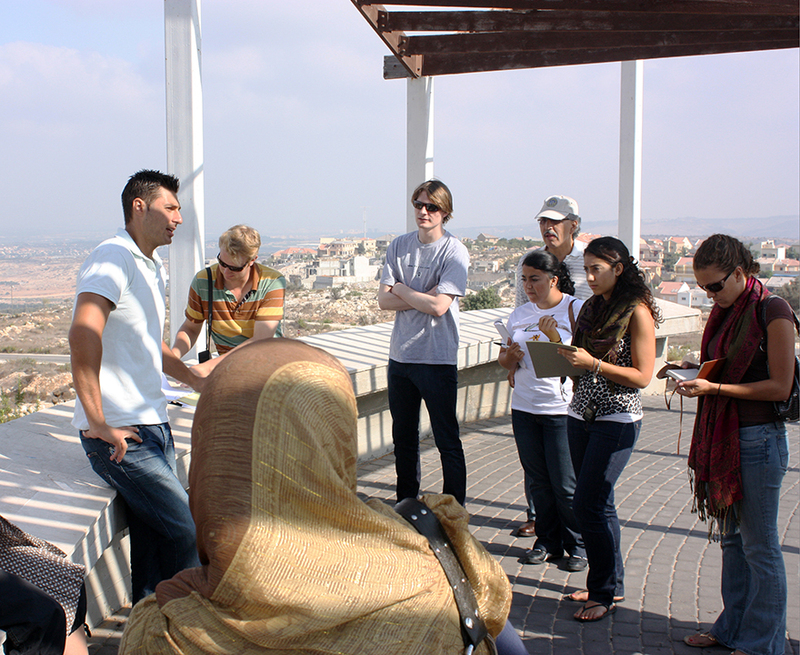 OTI participants gather at a site overlooking Jerusalem during the group's inaugural trip to the Middle East a decade ago. 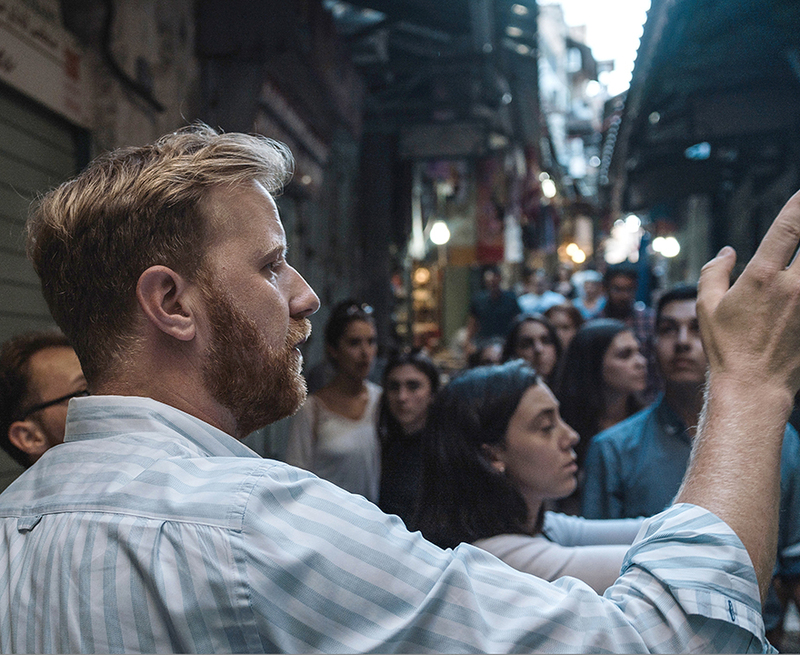 OTI co-founder Daniel Wehrenfennig shows students around Jerusalem's Old City in 2017.